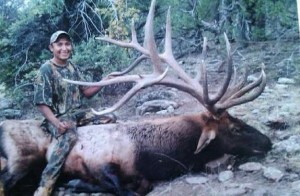 M Quintero jr shot this awesome bullelk on the WhiteMountain Apache reservation first day of his hunt he says he pass up many nice+400″ bulls that first day lucky he did he shot the bull at about 50yards first shot hit bull the bull fell over breaking two of its points!! it scored +465″ it wouldve went more if it didnt break its two points! 🙁 congrats manuel! Guess the Score of this White Mountain Apache Buck! I got to see this monster yesterday-pic does not do it justice!